Amalfi's Civic Museum is located on the first floor of the Municipal Palace of the ancient Maritime Republic. Here it is possible to admire gonfalons, historical relics, vestments and ancient costumes, used during the historical regattas, in addition to some works by Domenico Morelli. Particularly interesting is the XV century wording of the "Tabula Amalphitana", a precious maritime code dating back to the famous Maritime Republic. Made up by 66 chapters, of which 21 in Latin, the "Tabula" contains the laws concerning all the aspects of the navigation, from the freight to the payouts, to the duties and rights of the sailors. The museum also contains ancient nautical instruments and other objects of the medieval navy, found in the shipwrecks together with a celestial sphere of the XVII century. The natural habitat gives birth to species of plants rarely found in Italy, such as theWoodwardia radicands fern, a sort of living fossil, dating back to the Tertiary period. The Valle dei Mulini, uphill from town, was for centuries Amalfi's center for papermaking, an ancient trade learned from the Arabs (who learned it from the Chinese). Beginning in the 12th century, former flour mills in the town were converted to produce paper made from cotton and linen, being among the first in Europe to do so. In 1211 Frederick II of Sicily prohibited this lighter, more readable paper for use in the preparation of official documents, favouring traditional sheepskin parchment, but by 1811 more than a dozen mills here, with more along the coast, were humming. Natural waterpower ensured that the handmade paper was cost-effective, but catastrophic flooding in 1954 closed most of the mills for good, and many of them have now been converted into private housing. The "Duomo" was built in the IX Century, when the Maritime Republic started to impose itself as a commercial power. It was completely restructured in 1230, in accordance with the Arab-Norman influence introduced by the conquerors. The current façade of the "Duomo", decorated with thin layers of gold, was rebuilt, together with the long and grandiose stairway, in 1891. It is adorned in impressive mosaic, rich in forms and vivid colours, representing Christ sitting on his throne among the Evangelists. This masterpiece was created by Salviati of Venice from a draft produced by Domenico Morelli. The "Duomo" has a superb Romanesque bell tower, completed in 1276, decorated in majolica mosaics, and restored in 1929. Adjacent to the Duomo is the enchanting "Chiostro del Paradiso", of Arab style and decorated with intertwining arches leaning on coupled columns, it dates back to 1266 and preserves within finds of the Roman and Medieval eras. It is said to be the most beautiful part of the Duomo, hence its name (Cloister of Paradise). The magnificent Crypt that preserves the remains of Saint Andrew, patron saint of Amalfi, is also incredibly important. It was built in the XIII century to receive the remains of the saint brought from the East during the Fourth Crusade. Out of the 16 paper mills active at the end of the XVIII century, to this day, only about ten of them are still producing hand-made paper of the very best quality. Near the "Cartiera Amatruda", there is the Museo dell'Agricoltura, where we can see rudimental machines and various instruments of the last four centuries. With these instruments, for century the amalphitain farmer produced the famous lemon called “sfusato amalfitano ”. Different kind of fishing are possible but the most required is the throwing fishing during a boat tour of the Amalfi Coast: simply unforgettable. There are many fine ceramic shops along the Piazza Duomo. The Amalfi Coast is known for its beautiful ceramics. Its local product are very special like the Limoncello that is made from the finest Amalfi Coast lemons!! Don't forget to bring some home to your friends and family too!! In same day of the week there is a typical local market where you can buy many local product and dresses. If you like hiking you must do it on the Amalfi Coast. You get to see so much you would miss if in a car or on a sidewalk. You can take your time and let nature inspire you. There are many paths and stairways that go up thru the hills behind Amalfi and up to the town of Ravello. They make for the perfect hike!! 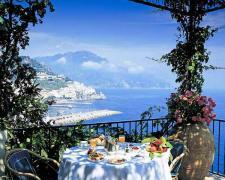 Visitors who choose the Amalfi Coast for their holidays do it for the small towns lapped by the sea, for the beaches, for the stunning views from the hotels or B6B in Amalfi, Positano and the other resorts, and for the monuments they want to visit in this area. The cobalt blue sea, the picturesque landscapes, the local cuisine with fresh local products, together with the excellent hotel accommodation on the Amalfi Coast, and the hospitality of the local people, makes this stretch of paradise one of the most exclusive travel destinations in the world. But there is an even more fascinating side of this Coastline, the less known Amalfi Coast. There are mountain paths originally used by pilgrims and merchants which are still in excellent condition which go through a wonderful unspoiled Mediterranean scrub. For those who dream for trekking on the Amalfi Coast. The pathways that open the way between the rugged mountains of the Amalfi coast offer breathtaking views of sea and sky, a true paradise for those who like bushwalking and trekking. For an unforgettable day, all you need is comfortable and suitable shoes, a camera and a passion for walks in the open air. Wandering along the pathways, and stairs of Amalfi, or Atrani, Ravello, Agerola, etc. is a very exciting experience. Amazing views are just in every corner and you can reach the other beautiful towns in an hour or two along the recommended paths. 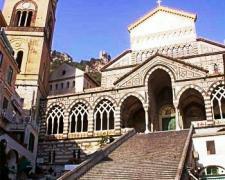 Wedding Ceremony in Amalfi A very exclusive location for religious and symbolic weddings.